Affluent consumers are a desirable target for brands across a range of sectors, globally. With higher income levels and a greater readiness to purchase items more frequently, they’re considered a cornerstone market for brands in the luxury space. But our research shows ¹affluent consumer brand engagement spans far wider than the luxury market, into the arenas of sports, gambling, motoring, business, economy and finance. This means far more brands can have a greater stake in the affluent consumer market, making it essential they fully understand this audience. Effectively targeting affluent consumers with the kinds of products and messaging that hits home comes from fully understanding their behaviors, as well as their attitudes and motivations. Here’s how to tap into this valuable audience. Attitudes and lifestyles: who are affluent consumers? Starting with a deep-dive into the attitudes and lifestyles of affluent consumers will put our behavioral findings into greater context. So what do we know about who these consumers are? Affluent consumers are an image-conscious and ambitious group. Our research shows they’re 50% more likely to fall into both the ‘cosmopolitan’ and ‘status-seeker’ segments than the average internet user. They value well respected brands that will elevate their position among their peers, with 69% saying they tend to buy the premium version of a product. Only 6% of this cohort fall into the ‘economical’ segment, occupied by those who seek value for money above all else from their purchases. This tells us affluent consumers prioritize brand status over the practical value of the product. Affluent consumers have high ambitions in both their personal lives and careers. 76% of this group say they’re motivated to be the best they can be, which aligns with their desire for higher value products and status-elevating items. Brands and products that contribute to their social status will be more appealing to them. Affluent consumers are also highly career-motivated, with 71% citing career progression as a key ambition. Combining this with the 64% who state investing money as a goal highlights the likelihood of this cohort being high-earners, but also that they seek financial security. Brand relationships: what drives advocacy? Nurturing advocates from customers can happen organically for some brands, but understanding what motivates this market to speak out can accelerate the transition. Foremost, the quality of the products is the primary factor that would motivate an affluent consumer to advocate a brand at 52%. Rewards (discounts, free gifts etc.) come in second at 41%, which is surprising given value for money is not prioritized by this group. Great customer service is the third most powerful advocacy driver at 37%, alongside a love for the brand. From this, it’s obvious that advocacy is much more dependent on how the brand and products make the customer feel. Just under a quarter say that a brand’s role is to make you feel like a valued customer. Brands that can tap into this by providing high-quality products delivered alongside rewards and discounts that makes them feel valued as customers will encourage brand loyalty, as well as advocacy. Entertainment habits: what do they enjoy doing? Social media is an important brand touchpoint for internet users. But it’s especially crucial for brands looking to target affluent users. 59% of affluent consumers are heavy users of social media. In this respect, affluent consumers reflect the global trend in social media usage. They’re using the platforms less to engage with friends, and increasingly to watch sports and research products. Broadly, sharing personal opinions and lifestyle content on social platforms is being replaced with a desire to view entertaining content and products to buy. Facebook is a popular platform for affluent consumers, with 86% owning accounts. Youtube comes in a close second at 81%. Similarly, visual search content platforms like Pinterest and Instagram both see an over-index when compared with internet users overall. This group is 58% more likely to have entered a competition by sharing a photo or using a hashtag related to a brand on Instagram in the past month. For brands, it’s clear social media is a key channel for accessing this audience, especially because of the dominance of visually appealing content which consumers can leverage to promote their image through the brand. For affluent consumers, mobile is now the device of choice when it comes to online purchasing with 65% using a mobile to purchase a product online in the last month. Because this group are more likely to own the latest devices, they’re in a good position to pay for items online using mobile technology. Having said this, a muli-device approach is advised when targeting this cohort, as PC/laptops (47%) and tablets (17%) still play a significant role when it comes to purchasing products online. Ensuring your content is dynamic means your online content will not only provide strong user experience via mobile, it will adapt to cover the wider spectrum of devices used by this group. Brand engagement: how do they interact? We’ve established what motivates affluent consumers to purchase products, but it’s also imperative to understand how they discover and research brands. Search remains the most powerful means of brand discovery for this group, with 40% claiming this is how they find new brands. Similarly, 49% say search is how they research products and services. 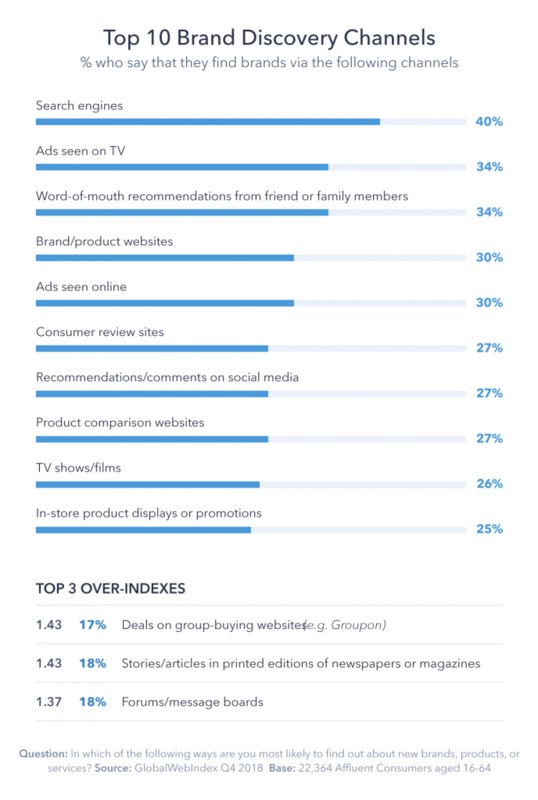 More traditional advertising channels are also effective for reaching this group, TV ads and word of mouth being the second-most cited sources of brands discovery at 34%. As anticipated from their heavy use of social media, paid media via this channel also plays a key role in both brand discovery and research for affluent consumers. According to our research, 37% of affluent consumers use social media to research brands, while 27% discover brands from recommendations and comments via social media. 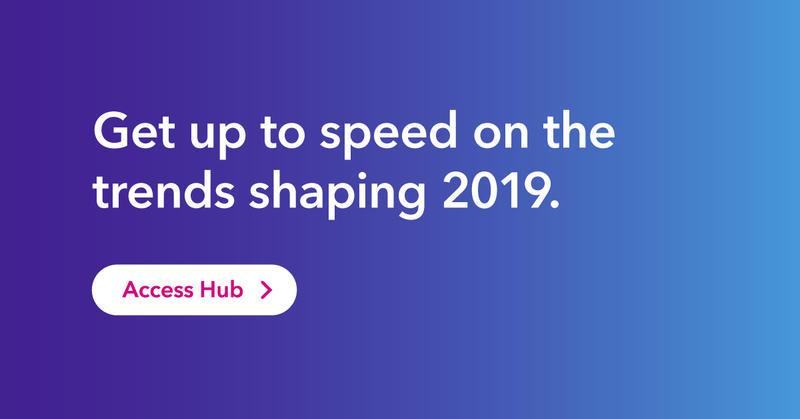 In order to expand its omnichannel strategy and target affluent consumers in particular, United Overseas Bank has created a wealth banking branch in Singapore that’s focused on providing highly personalized digital experiences. Once a customer’s identification card is scanned, AI technology sends tailored information about financial products to their smartphone. This information is also sent to a dedicated relationship manager responsible for building an investment portfolio that meets the customer’s personal finance goals. That level of customer service and engagement, all made available via mobile, is crucial for this audience, as our data shows that as many as 3 in 10 investments in Singapore reach 700,000 SGD. Emotion plays an important role in influencing what we buy, and with affluent consumers, this certainly rings true. This is a prime example of how insights can make the difference between success and failure. Affluent consumers are receptive to brands across a wide range of media types (both modern and traditional) and via a number of devices, meaning you should be prepared to adopt a multi-channel approach. These consumers are ready to purchase from brands that speak to them on their level. Looking beyond their behaviors to their motivations and perceptions adds an extra layer of security and simplicity. Knowing what motivates this group to purchase and advocate brands will enable you to craft the messaging that speaks to their desire for image-projection, quality, security, and wealth across the most impactful channels. The post The Attitudes of Affluent Consumers & How Brands Can Tap Into Them appeared first on GlobalWebIndex Blog.